A cross-country skier was rescued by helicopter Sunday afternoon after he crashed through the ice covering a remote mountain lake outside Pine Valley. 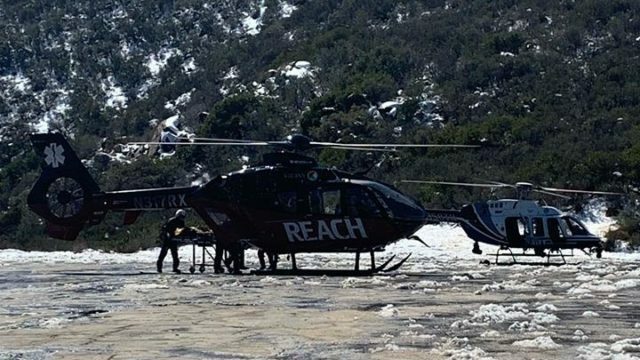 The San Diego County Sheriffs Department received a call at 11:45 a.m. from a witness who saw the skier cross plunge into Big Laguna Lake — about 8 miles northeast of Pine Valley — after skiing over a section where the ice was too thin, about 75 yards from the shoreline. The Sheriffs Department dispatched one of its ASTREA helicopters, a spokeswoman said, which hovered over the lake and lowered a tethered flotation device to the man, who had been able to keep his head above water for nearly half an hour. The helicopter lifted him from the lake shortly before 12:15 p.m.
A second helicopter flew the man to Sharp Grossmont Hospital. His condition is unknown.